As per sthalapurana, the Lord took the four forms as Ambarisha wished to worship the Paradevata in Vyoohavatar roopa and obtain His blessings. It is believed that Dharmaputra worshipped the Perumal at the centre, Arjuna - the one on the west side, Bheema - the one on the left and Nakula and Sahadeva worshipped the Lord on the right side. Ambarisha attained Moksha here. The Moolavar is Uyyavandha Perumal, Abhayapradhan seen in standing posture facing south. There is a sannadhi for Lord Siva, as soon as we enter the temple. The Perumal sannadhi is behind this. The five Pandavas are said to have done penance here. There are 4 murthis. It is said that Dharmar worhsipped the central moorthi, Arjuna the murthi on the west, Bheema the murthi on the left, Nakulan and Sahaadevan the murthi on the right. Thaayaar - Vithuvakottuvalli, Padmabaani Naachiyaar. 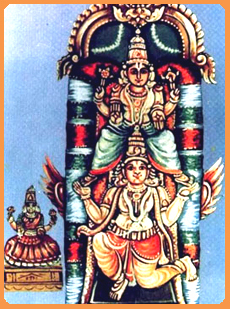 The Moolavar of this sthalam is Uyyavandha Perumal. He is found in Nindra Thirukkolam facing his thirumugham along the south direction. He is also named as "Abhayapirathan". The perumal is prathyaksham for Ambhareeshan. This sthalam is found in between Shoranoor to Kallikkottai, next to Pattambi. We can also reach this sthalam while travelling through Shoranoor to Guruvayoor and has to travel around 10 kms . While travelling in train, we have to get down in Pattambi railway station which is found on the Shoranoor - Kallikkottai lane and after travelling 2 kms, we can reach this sthalam. Staying facility in Pattambi is available. This sthalam is popularly called as " Anjumoorthy Koil ".